Andrew Murray was a writer, teacher and pastor in South Africa in the second half of the 1800’s and early 1900’s. He wrote over 240 books, several of which are considered Christian classics. He wrote several short books that were intended to be a daily meditation on a subject for a month. 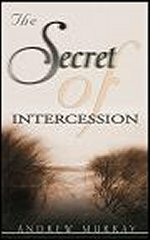 The Secret of Intercession has 31 short chapters and 125 pages. Each chapter begin with a verse and ends with a prayer. The chapters build upon the previous ones laying out what is; “the solemn duty, the high privilege, and the wonderful power of intercession.” What follows are key points from the first few days meditations. This is one of the books that greatly influenced my life and helped lay the foundation in me for prayer and intercession. Non-disclosure: I bought this book a long time ago, probably used, and no publisher put me up to this as part of a bloggers program, but they did give me the idea to review books I truly love. Day 3 – Man’s Place in God’s Plan – “He has to entrusted His people the work of making these blessings known and making men partakers of them. Be…faithful in seeking for treasures hidden in heaven, to bring them down in blessing on the world. It is by the unceasing of God’s people. Day 5 – God Seeks Intercessors – “There are so few who know what it is to take hold of His strength and pray down His blessing on the world. Day 7 – The Intercessors God Seeks – Those who will persist until the blessing comes. Day 8 – The School of Intercession – Learning to pour out your soul. Day 9 – The Power in the Name of Jesus – Unlimited promise in His name. Day 12 – God’s Will and Ours – His will becoming ours. Day 13 – The Blessedness of a Life of Intercession – The wonderful awesome honor. Day 19 – Prayer for All Saints – Unity by praying for all. Day 21 – The Grace of Intercession – The Spirit of grace and supplication. Day 24 – Intercession, The Link Between Heaven and Earth – Heavenly pattern here. Day 28 – Intercession Day and Night – consuming desire doesn’t rest. Day 29 – The High Priest and His Intercession – a kingdom of priests. Day 30 – A Royal Priesthood – Our holy calling enter the holiest for others. This entry was posted in Andrew Murray, Intercession, Prayer and tagged Andrew Murray, Old Books, Review. Bookmark the permalink.